Debt greases the wheels of the economy. It allows individuals to make big investments today–like buying a house or going to college – by pledging some of their future earnings. That’s all fine in theory. But as the global financial crisis showed, rapid growth in household debt – especially mortgages – can be dangerous. 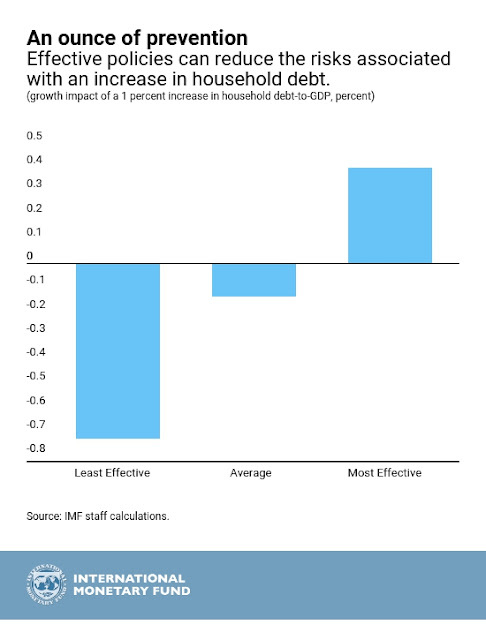 A new IMF study takes a close look at the likely consequences of growth in household debt for different types of economies, as well as steps that policy makers can take to mitigate these consequences and to keep debt within reasonable limits. The overall message: there is a tradeoff between the short-term benefits and the medium-term costs of rising debt, but there is plenty that policymakers can do to ease this tradeoff, according to Chapter Two of the IMF’s October 2017 Global Financial Stability Report. Given the widespread misery the crisis caused, you might think people have become skittish about borrowing more. Surprisingly, that’s not the case. 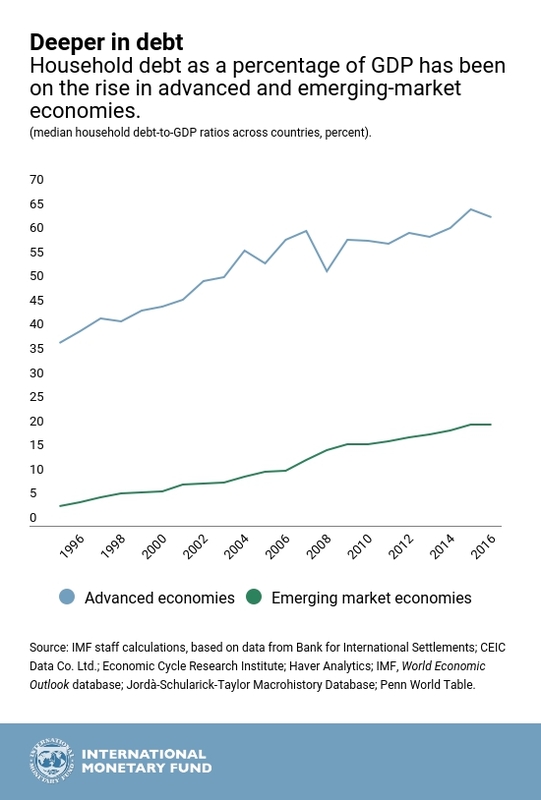 Since 2008, household debt as a proportion of gross domestic product has grown significantly in a sample of 80 countries. Among advanced economies, the median debt ratio rose to 63 percent last year from 52 percent in 2008. Among emerging economies, it increased to 21 percent from 15 percent. In the short term, an increase in the ratio of household debt is likely to boost economic growth and employment, our study finds. But in three to five years, those effects are reversed; growth is slower than it would have been otherwise, and the odds of a financial crisis increase. 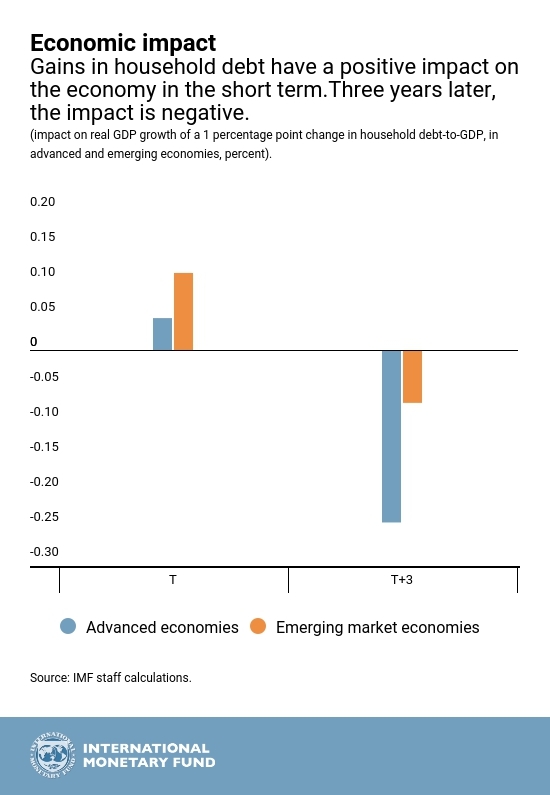 These effects are stronger at the higher levels of debt typical of advanced economies, and weaker at lower levels prevailing in emerging markets. What’s the reason for the tradeoff? At first, households take on more debt to buy things like new homes and cars. That gives the economy a short-term boost as automakers and home builders hire more workers. 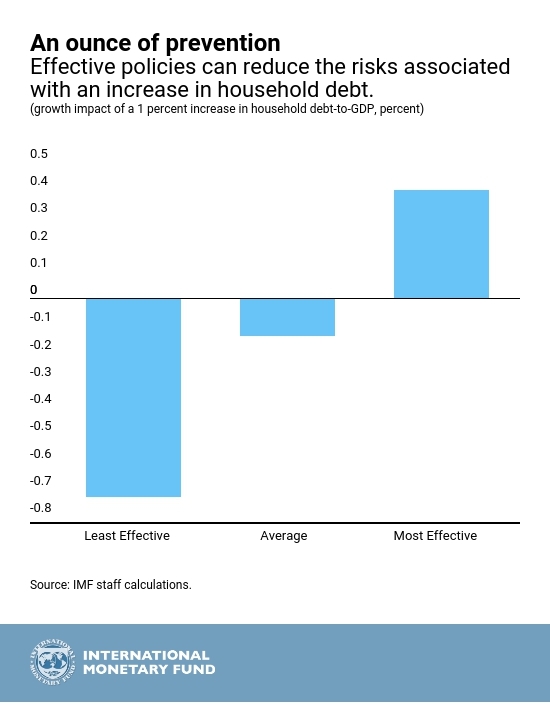 But later, highly indebted households may need to cut back on spending to repay their loans. That’s a drag on growth. And as the 2008 crisis demonstrated, a sudden economic shock – such as a decline in home prices–can trigger a spiral of credit defaults that shakes the foundations of the financial system. More specifically, our study found that a 5 percentage-point increase in the ratio of household debt to GDP over a three-year period forecasts a 1.25 percentage-point decline in inflation-adjusted growth three years in the future. Higher debt is associated with significantly higher unemployment up to four years ahead. And a 1 percentage point increase in debt raises the odds of a future banking crisis by about 1 percentage point. That’s a significant increase, when you consider that the probability of a crisis is 3.5 percent, even without any increase in debt. The good news is that policy makers have ways to reduce risks. Countries with less external debt and floating exchange rates, and which are financially more developed, are better placed to weather the consequences. Better financial-sector regulations and lower income inequality also help. But this is not the end of the story. Countries can also mitigate the risks by taking measures that moderate the growth of household debt, such as modifying the down payment required to purchase a house or the fraction of a household income that can be devoted to debt repayments. So, good policies, institutions, and regulations make a difference – even in countries with high ratios of household debt to GDP. And countries with poor policies are more vulnerable – even if their initial levels of household debt are low.